We are excited to partner with our sponsor, FragranceNet.com, in bringing you a lovely giveaway! You may think that FragranceNet.com only carries Fragrances but, you would be wrong. They have everything from makeup to hair care to candles and of course, fragrances for men and women. We were so grateful to receive these products from the friendly people over at Fragrance Net. 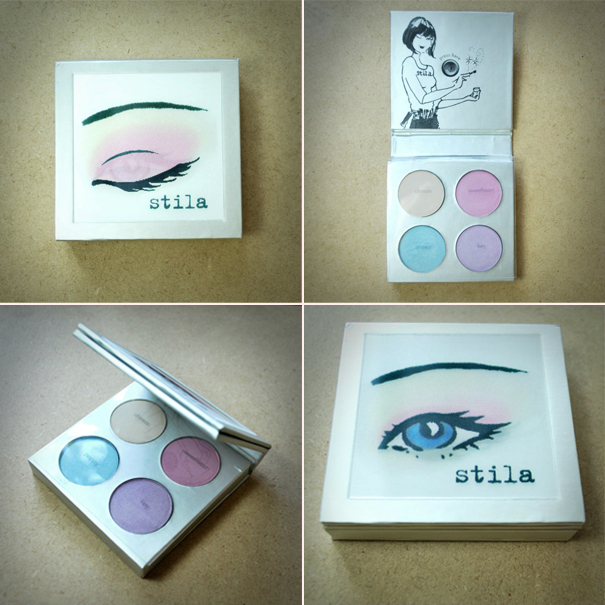 The Lovely Eye Palette from Stila does not contain colors I normally wear, but I'm always open for trying something new (especially with makeup). The colors are true to how they appear. However, they are pretty chalky and you definitely need to wear an eyeshadow base under them. You will need to layer the color to get the best color payoff. Overall they give a nice wash of color instead of heavily pigmented color. These would also probably do better if you used them wet. If you are into pastel eyeshadow, then this would be a good palette to try. Simply Bell smells very clean and is not something I'd usually wear. To me, it smells like a body wash which... is not a bad thing at all. I tend to lean more towards sweet perfumes but if you like a fresh and clean scent, this may be for you! Our friends over at FragranceNet.com have decided to give a $50 gift card to one of our readers! To enter- head over to their website and figure out what product you'd really like to try. Then leave us a comment telling us what that product is! To be eligible, you must be a follower of our blog and only one entry per person please! The giveaway will end Friday, September 14th at midnight. Good luck! would love to try the jimmy choo perfume! i really want to try lovestruck by vera wang! I really want to try Flowerbomb by Victor and Rolf. I love to try the Helena Rubinstein mascara! I would love to win the Cameleon By Cameleon Makeup set! OH GOODNESS! THEY HAVE MY FAVORITE! Harajuku Lovers "G"! I would love to try For Feet's Sake. I think it would smell so good. i think i'd probably want to try smoothing lusterizer defrizzer & tamer by tigi s factor! my hair is such a mess lately! I'd just love to try Belle d'Opium by Yves Saint Laurent! Sounds like my kind of perfume! The Channel Coco is what my mother wore growing up! I would love to give that I try!! I would love to try Marc Jacobs' Daisy Hot Pink! I would love to try Daisy by Marc Jacobs! I would love to try Ralph by Ralph Lauren. I've heard so many good things about this scent, but have yet to try it. I would like to try the Juicy Couture eau de parfum! I would love to try Cameleon Makeup by Camelon! It would be fun to experiment with all the fun colors. I am already a follower of your blog and would LOVE to try CLEAN perfume. I love the smell of clean laundry... don't you? I would like to try Michael Kors suede. I love people smell me entering a room. I would love to try Purity made simple- one step facial cleanser! I would love to try their eyeshadow pallete! I want to try the Redken all soft argan-6 oil. I would love to get aspen cologne for men. I love it when my husband wears this! I didnt know they sold more than fragrances either!! How exciting! They always have great promos! I'd love to try Laura Mercier mineral finishing powder! Even though they sell more than fragrances, I would still like to try a nice new scent! I'd like to try Coach Poppy Flower. I tried it in Macy's and loved it! I'd love a bottle of my own! I would love to try a new perfume. I love D&G light blue but I would love to get something new!!! I would love to try CK one!